Letterman's Late Show in Talks With L.A. Nik, "The Mayor of Minneapolis After Dark"
MINNEAPOLIS, MN--(Marketwire - Jun 13, 2012) - The "Mayor of Minneapolis After Dark" (L.A. Nik), as deemed by Minneapolis Star Tribune, is a complete fish-out-of-water character that continues to rise in popularity in Minneapolis, MN. A transplanted Hollywood rocker, the public figure has deemed himself an ambassador to downtown Minneapolis and is a respected voice across a diversified audience who has gained the attention of national talk show host David Letterman. L.A. Nik, a man wealthy with friends and relationships, was introduced by longtime friend Barry ZeVan, the infamous television weatherman (now President and CEO of The ZeVan Corporation, a PR and Communications consultancy) to the segment producer at LATE NIGHT. ZeVan, a longtime acquaintance of David Letterman and an instrumental piece of Letterman's career, starting with Mitzi Shore of the Comedy Store, (a home to L.A. Nik for nearly a decade) made a recommendation, in good faith, that L.A. Nik is the most off-the-wall character Minneapolis has ever seen and quickly becoming a household brand. L.A. Nik's upcoming book "Rockin' This Life" (a self-help book of sorts) is a much-anticipated topic of discussion for LATE NIGHT. 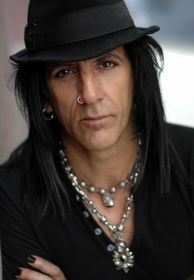 L.A. Nik was quoted saying, "This is not a book about tall tales and the rock star lifestyle. It's a personal memoir about how to learn from the past and look to the future, how to deal with adversity and overcome massive obstacles." L.A. Nik, an unfiltered individual with the power of difference, will discuss his likes and loves about the city of Minneapolis, as well as adamant dislikes and clear misses, based on a life of travel. Look for this interview, the upcoming book and more from downtown Minneapolis with L.A. Nik.